Takes up to a double size wood ashes casket. Double size caskets side first. 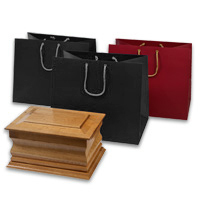 Standard size caskets fit bottom first. Rope handle and metal eyelets for strength. Dimensions (in cm): 36 x 25(W) x 30(H). Colours available: Burgundy, Blue and Green.